re-bop be-bop mop and stop. In her treasury of private memories, Bud Powell's daughter, Celia, recalls her father as an uncomplicated man, "content with the simple things in life, not wanting much more than a meal and to play." But in the public world where he established his fame, Powell cut a more challenging figure. His work represents, for many, a pinnacle of artistic achievement among the pantheon of brilliant jazz pianists. His relentless flow of musical ideas-their unsettling rhythmic disjunction; those explosive launches into beautifully crafted passages of push, pull, run, and riff, punctuated by the perfect landing at ferocious speeds-remains an inspiring, though intimidating, factor for pianists who come behind him. Indeed, his brilliance in the bebop idiom pushed jazz musicians of all stripes to high standards of performance that have rarely been matched. His contributions have been as germane to the modern jazz pianist's training as Czerny five-finger exercises and Bach Inventions are to that of classically trained pianists. Despite his importance to jazz, he remains one of the music's lesser-known figures. Yet he was a towering pianist who inspires awe and respect among those in the know. Bud Powell was not only one of the greatest bebop pianists of all time, he stands as one of the twentieth century’s most dynamic and fiercely adventurous musical minds. His expansive musicianship, riveting performances, and inventive compositions expanded the bebop idiom and pushed jazz musicians of all stripes to higher standards of performance. Yet Powell remains one of American music’s most misunderstood figures, and the story of his exceptional talent is often overshadowed by his history of alcohol abuse, mental instability, and brutalization at the hands of white authorities. In this first extended study of the social significance of Powell’s place in the American musical landscape, Guthrie P. Ramsey, Jr. shows how the pianist expanded his own artistic horizons and moved his chosen idiom into new realms. 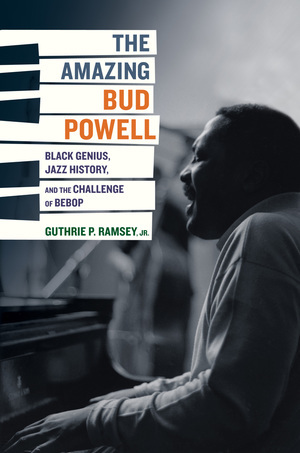 Illuminating and multi-layered, The Amazing Bud Powell centralizes Powell’s contributions as it details the collision of two vibrant political economies: the discourses of art and the practice of blackness. Guthrie P. Ramsey, Jr., is the Edmund J. and Louise W. Kahn Term Professor of Music and Africana Studies at the University of Pennsylvania and author of the prize-winning Race Music: Black Cultures from Bebop to Hip-Hop (UC Press).